It is a sign of a band’s success when they can release a bad album, recognized as so by media and fans alike, and still remain massively popular, sell-out stadiums that seat 50,000 people, and leave fans still crying for more work. Such is the story of Rush, who have released a multitude of albums throughout their lengthy career which, how does one put this, vary as much in their reception as the faces of their fans (which are numerous and diverse). Rush was born in Anytown, Canada…Sarnia to be exact, and initially grew as a band by offering spunked-up versions of Lep Zepplin and Cream classics. Realizing quite quickly that Sarnia, as nice at it is, was not the place to launch a music career, the boys (who originally consisted on Alex Lifeson, Geddy Lee and John Rutesy) took off to Toronto and soon saw their lives take off. It took several albums, including Fly By Night and Caress of Steel, before Rush broke through with 2112. 1977’s A Farewell To Kings, which featured Rush’s megahit “Closer To The Heart”, started a selling streak which continues to this day. Every album since this release has achieved gold or platinum status. Rush were part of the founding movement of what was called “Progressive Rock”. Not quite metal, not quite rock, the music combined eclectic melodies with long, looping solos. Even after critics declared Progressive Rock dead in the early ‘80s, Rush continued in their success with radio hit after radio hit. 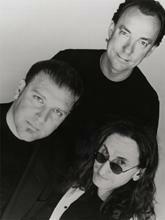 Much of Rush’s success (and criticism) has centered a round lead singer Geddy Lee. Originally singing with vocals that defy description, other than to make the comparison of a teacher scratching the blackboard with long fingernails, Lee toned down his act around 1982. It would be this new Geddy Lee, with all his personality and charisma, that lead Rush throughout the latter part of the ‘80s and into the next decade. Despite their large success Rush has remained grounded. The band continues to devote their time to charitable causes and were given the honor of The Order of Canada in the early ‘90s to recognize their contributions to Canada and music in general.